It's been a busy few days and I have lots of new pictures to share - and some uncertain identifications. We've been back to Babcock-Webb a couple of times to continue our search for the rare Red-cockaded Woodpecker, but he is no where to be seen. Instead we've seen hawks and eagles. 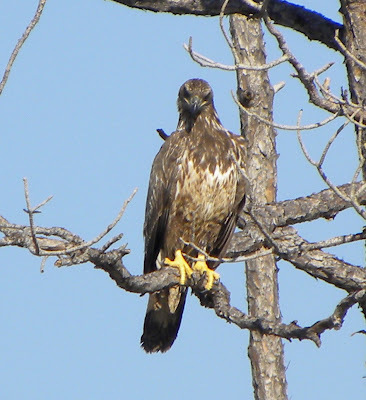 We were watching this juvenile Bald Eagle - off in the distance - having no clue what it was at the time. what seemed like a fight broke out overhead. 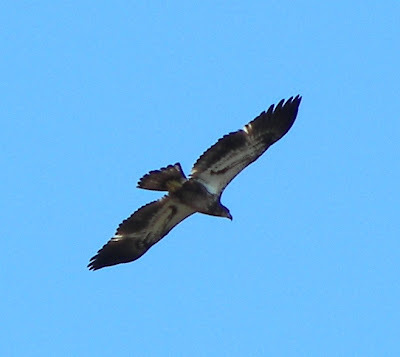 At the time we thought this was an Osprey. 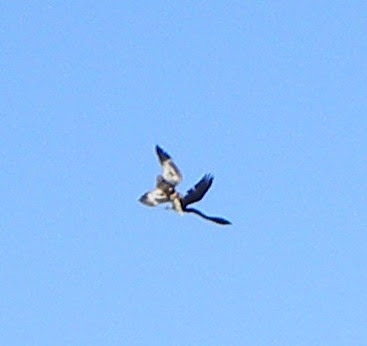 He seemed to be clashing with a Bald Eagle. 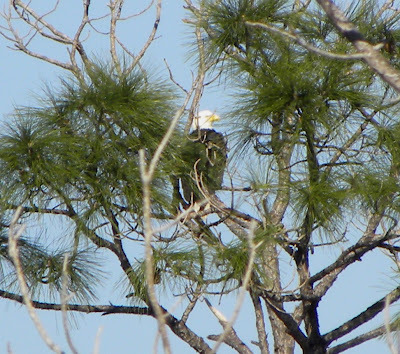 We now realize the two birds were both Bald Eagles, the adult and the juvenile. 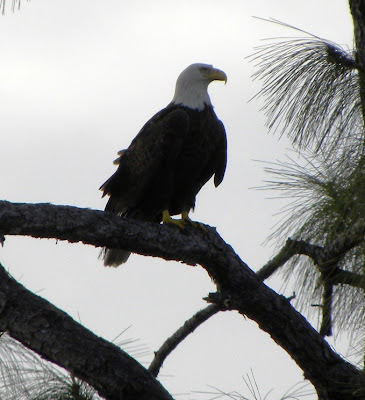 This beautiful Bald Eagle landed in a tree on the other side of a lake. He was at quite a distance - but I had seen him land so I knew where he was. In the commotion, the juvenile - that I did not identify until I later looked at my pictures - had disappeared. 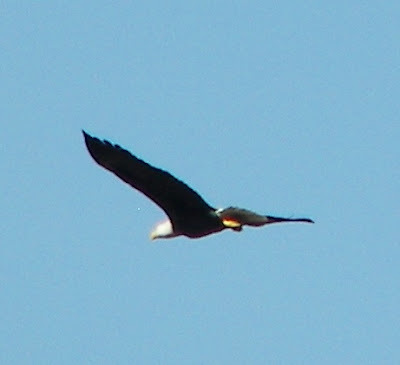 I took this picture of what I'm sure is the same eagle a couple of days later. Wow - I can't begin to describe the feeling when you see such a magnificent animal. This hawk was another stumper. 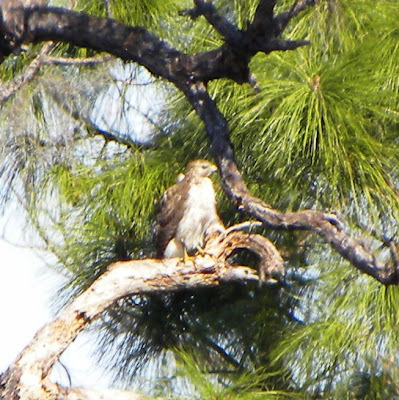 We have tentatively decided it is a Northern Harrier. When he finished his meal and flew away, he glided low to the ground. This is typical of Northern Harriers. 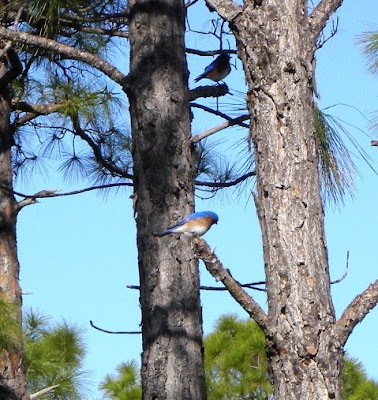 We found lots of Bluebirds in the Pine trees. Babcock-Webb has worked to increase the Bluebird population with good success. 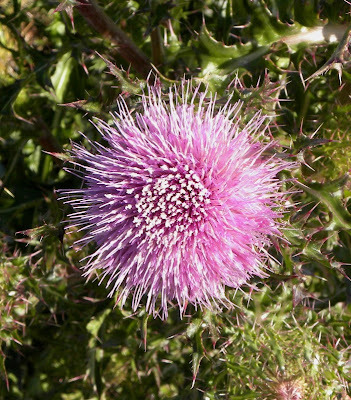 Along a canal, we found this thistle in full bloom. 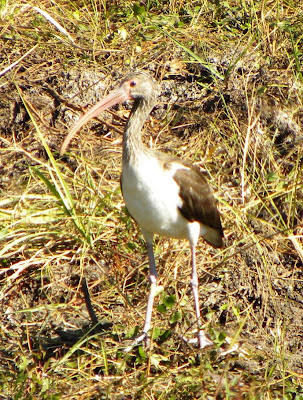 And lots and lots of white Ibis. This one is a youngster and has not yet turned snowy white - but he will. 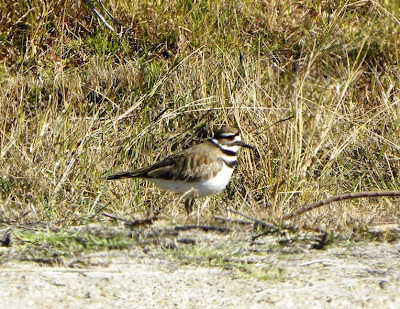 Killdeer are the only Plovers you will find inland. 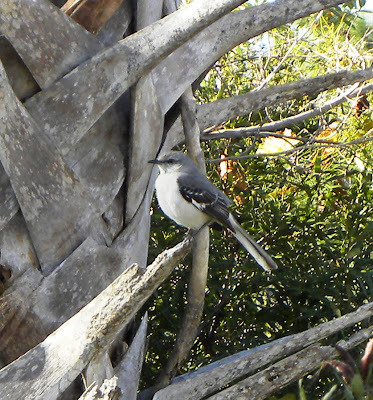 I've seen them in Kansas and Colorado as well as here in Florida. 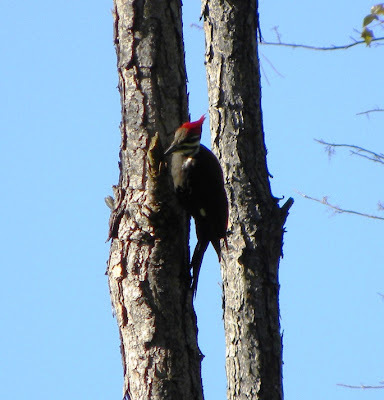 It's always a good day when we see a Pileated Woodpecker! The next day we visited Six-Mile Cypress Slough and the little birds were everywhere - but would they stay still long enough to have their picture taken? NO! 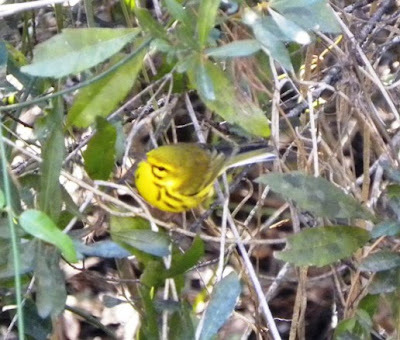 We saw Blue-gray Gnatcatchers; Yellow-throated, Yellow-rumped and Black-and-white Warblers; Pine and Palm Warblers; Solitary and Yellow-throated Vireos along with some we have no clue what they were! This Palm Warbler was playing a fast game of hide-and-seek. 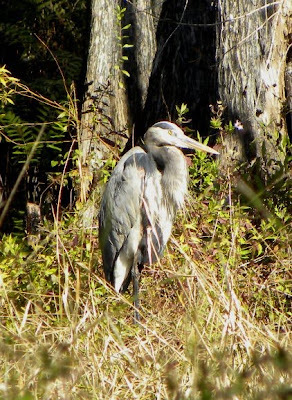 I never get tired of seeing Great Blue Herons. On Thursday, we drove back up to Ocala - about an hour north of Orlando - to take another look at On Top of the World - a 55 and older retirement community. Alex showed us lots of homes - from a $35,000 attached villa (that was amazingly nice!) to newer and nicer single family homes. We are impressed with all of the activities offered - including an RC flying club with their own flying field, several pools (both outdoors and in), birding club, photography club, wood shop, etc. This is the house we liked - it's small, 2 bedrooms, two bathrooms, nice eat-in kitchen, lanai with heat and air, a 2-car garage with room for a shop and a backyard where we could have a BBQ grill, bird-feeders, etc. There is a lot to consider. 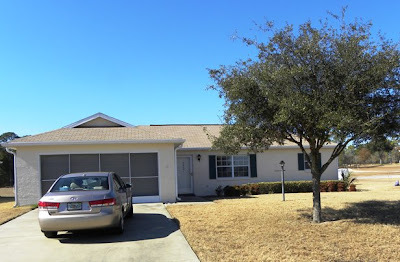 I would miss the vacation paradise here in Fort Myers with the beach just 5 miles away, a beautiful lake in our backyard and all the friends we've met, but would enjoy an adult community and a single family house where we have more freedom. Bill would certainly love to have a flying field closer than he has here.